Katie and I found ourselves in Philly this weekend visiting our third almost-sister, Jess. Both sets of our parents came up on Saturday morning and the first thing on *my* to-do list was to do a Federal Donuts taste test. Federal Donuts was recommended to me on my autumn trip to Philly, but we didn't have enough time that morning to check it out. I was determined to not miss out again this time around. Federal Donuts is known not only for their donuts, but also for their fried chicken. I *love* me some fried chicken, but 9 am seemed a little too early for that on Saturday when I went to go pick up a sampling for our parents (okay, definitely mostly for me). Instead of making the incredibly difficult choice of which donut varieties to get, I ordered one of each. When I got back to Jessica's place after spilling *a lot* of my coffee on my hand and sneaking into Starbucks to steal some napkins, I cut each donut into 8 pieces so that we could each try each flavor. Consensus was that the fancy donuts were better than the hot/fresh ones, but this may be a factor of that they weren't hot anymore when we devoured them. Our favorite fancy donuts were definitely (1) Sea Salt & Chocolate (2) Cookies & Cream (3) Sticky Bun, but all of them were really sweet and unique. Gingerbread and Pumpkin Spice Latte seemed a little out of season to me, but I still enjoyed them. There are two Federal Donuts locations in Philadelphia right now (Center City & South Philly) with two more opening up soon. It has been rumored that Federal Donuts may expand into NYC and if this ends up being the case, I will definitely be doing taste tests there as well. Next time I am in Philly, I plan on trying the hot donuts while they are still hot *and* the fried chicken. You certainly can't go wrong with chicken and waffles, so I imagine chicken and donuts would be even more satisfying. If you are on spring break and age 22, you will LOVE New Orleans' famous Bourbon Street. But everyone I asked for recommendations from told me to stay away. Bourbon Street is fun, if all you're doing is drinking your face off, but it's not real New Orleans. It's neon lights, 3-for-1 beers, and top 40/hip-hop music. Below are some of the best drinking establishments MK and I went to in NOLA that are not on Bourbon, plus two that *are* actually on it. Don't think about it too much. The first place MK and I stopped when we got to NOLA was Pirate's Alley. We enjoyed drinking in their adorable alley out in the sunlight as we hadn't been able to drink outside in months in New York. Our plans for the day were decided while sipping our drinks - a Bloody Mary for him and a Pirate Punch for me. We later learned from a ghost tour app we downloaded (Wicked Walks New Orleans) that because Pirate's Alley is right next to both St. Louis Cathedral (home of the cemetery we toured) and the Cabildo (an old government building), this bar is the world's closest proximity of Church, State, and Bar. It was on said ghost tour because on the site used to be a Spanish prison which held some of New Orleans' most famous pirates and some of them did not walk the plank willingly. To be quite honest, it was almost impossible to get a drink at Carousel Bar. I think the last time I waited that long for a drink was from the time I was born until I was in high school. Zing. Okay, it wasn't *that* long of a wait, but the actual reason I put this bar on the list is because the night we went, there was an AMAZING Beatles tribute band - Jubilation. I'm a huge Beatles fan so I was way into the music, but even better than the music was the crowd - tons of former hippies, drunk, dancing, and wearing Lennon glasses. After our third amazing sandwich of the trip, MK and I stopped at Lucy's, a cute little beach-theme bar on Tchoupitoulas Street, which we kept mispronouncing as "Chipotle Street," among other things. We went because our lunch dates had told us about a shot you can take there - tequila with an actual tequila worm in it. If you take the shot, you get a free t-shirt. I was thinking about it, you know, "for the story" (well, and for the t-shirt), but I decided it probably wouldn't be the best thing for my stomach. We drank really boring bottles of beer instead, with no insects in them - at least with none to our knowledge. On Saturday night, we canned over to Freret Street and met up with MK's local friends who we'd eaten lunch with earlier that day. Publiq House is definitely a more local place than everywhere else we went but it has some tourist appeal for sure. I think I tried every one of their "beer cocktails" which is probably why I climbed over a fence to get to our cab on the way back and then didn't feel so great the next morning. To give you an idea of what a beer cocktail is, the "Floradora" is gin, framboise, lime, and ginger ale and the "Coupe de Ville" is Abita Light, Anejo tequila, lime juice, OJ, and Grand Marnier. I had to try all five of them, but I guess I didn't need to have all five plus a few others to myself. MK and I had heard that Frenchmen Street was where more of the locals hung out instead of Bourbon. This was also where we could find some good real New Orleans music. We got there kind of early, as we were told things started hopping around dinnertime, so after a nap in a nearby park with a bunch of hippies and dogs, we wandered over to Spotted Cat Music Club where we found an adorable band, a fun couple to chat with, and a piano in the ladies' room. Blue Nile is another bar on Frenchmen Street, visited later that evening, with live music. We originally were going to go elsewhere but the band was just ending their set at the place next store. It was actually really lucky that the other bar had been done for the night, because we came across Blue Nile and an amazing brass band which we may not have discovered otherwise. These next two bars *are* actually on Bourbon Street, but you should definitely check them out. Sure, I have made many a visit to what's touted as the oldest bar in Manhattan, but Lafitte's Blacksmith Shop is said to be the oldest bar in THE COUNTRY, built in the early 1700s. You betcha I wanted to go check it out for that reason *and* for the potential for ghosts. The fireplace in the main room is said to sometimes show two bright red lights that, when inspected, are actually a pair of eyes, red with blood. Rumor has it that Lafitte at one point buried gold underneath the fireplace and killed a man on the site so that this man's ghost would guard the gold for eternity. MK and I did not see anything in the fireplace, but he did definitely move seats in the completely dark room in the back while I grabbed beer from the bar in an attempt to scare me. If this had been after our trip to Pat O'Brien's, the next stop, I may have been fooled. Pat O'Brien's is famous for inventing "the hurricane": a fruity and rum-filled drink served in a glass that looks like a hurricane lamp. MK and I sat down in the piano bar where the performance was just starting up for the night. We requested lots of amazing songs, written on cocktail napkins, just as we would have at one of my favorite NYC bars. The pianists kept telling me they would not play my awesome request of "Buffalo Gal, Won't You Come Out Tonight" from the best Christmas movie of all time, "It's a Wonderful Life," but aside from that, it was an amazing time. We had *several* rounds of hurricanes and had so much fun that we didn't remember what we had done for dinner until much later the next day. When MK and I were on our way back from New Orleans last month, our flight from Atlanta to NYC was cancelled because of the snow in the northeast. We weren't able to get a new flight out until more than 24 hours later. At first I panicked (surprise), but once I got everything figured out with work, we decided to embrace an extra day on vacation and enjoy our time in Atlanta. We rented an awesome Town & Country minivan and drove to Buckhead where we decided to stay based on the advice of some friends. That night we went out for a few local brews and spinach dip at the Ivy with one of MK's friends from college. In the morning, we had one more awesome southern breakfast (biscuits and gravy) and then headed to our main attraction, the Georgia Aquarium. Now, I haven't been to an aquarium in quite some time, but I would venture to say that the Georgia Aquarium is at the top of its craft. It was the largest aquarium in the world when it opened a decade ago and is home to over 100,000 living creatures. The absolute coolest part of the aquarium is the "Ocean Voyager" exhibit, a ginormous tank (6.3 million gallons!) with thousands of cuties (and some not-so-cuties) swimming around together, living as one. The aquarium is most proud of their four whale sharks (the largest fish species in the world) and their four manta rays (the only ones ever to be in an American aquarium). The tank can be seen through many different views including a tunnel and a giant viewing window bigger than a movie screen. When I was younger, I was obsessed with penguins (and kind of still am) so I became excited when we walked over to the "Cold Water Quest" section of the aquarium. I was even more excited when I realized we could crawl under the exhibit and pop our heads up into the penguins' actual living area. It was a bit claustrophobic for me and even more for MK at 6'4", but it was awesome to be face-to-face with the little guys for a few minutes. We also were able to hang out with the beluga whales and some awesome otters there. At first glance, the large tanks of jellyfish in "Tropical Diver" looked like animated screensavers. I'm used to seeing dead clear jellyfish on the Jersey Shore and not these vivid swimming creepers. Speaking of creepers, MK freaked out a little about an octopus in one of the tanks in this exhibit, as it suctioned and unsuctioned its tentacles against the glass and climbed over a starfish like it wasn't even there. At least I can tease him about this whenever he reminds me of my 20 texts in a row I sent him once when I was panicking about the mouse in my apartment. The other two main exhibits, "Georgia Explorer" and "River Scout," were a little less exciting for us as they were meant for kids. We took advantage of the opportunities to reach into tanks and touch sea urchins, starfish, and stingrays, but walked through the rest pretty quickly. I did accidentally miscalculate the level of the water when I was petting the stingray and stuck my whole arm, jacket, and sweater into the water. Luckily, my seatmate on our flight a little later didn't mind the seawater smell too much. He was just glad I wasn't an octopus. Each winter, the city of New York holds "Broadway Week," a misnomer as it actually lasts a few weeks - as does every week-long celebration here, see "Restaurant Week." This is not a complaint, as I'm glad that we have more than one week during which popular shows offer 2-for-1 tickets. It's unfortunately over for the season, but "Off-Broadway Week" is February 17 - March 2 if you're interested. Back in the day, one of my "26 Things to Do Before I Turn 26" list items was to see 10 shows that year. At the time, I lived close to the Theater District and could easily take advantage of last-minute Stub-Hub or TKTS purchases. I think I only got to 9 that year if we're being honest with each other. But I realized early this year that I have somehow not seen anything on or off Broadway in over two years. Perhaps I've just filled my schedule with too many hipster shows: Upright Citizens Brigade, the Moth, and Mortified. It was time to return to Broadway. Kater and I got tickets to "Waiting for Godot" for last week. I only knew a couple things about the show before heading to Cort Theatre. (1) It stars Sir Ian McKellen - aka Gandalf - and Sir Patrick Stewart - aka Captain Jean-Luc Picard of the USS Enterprise. (2) The cast and crew puts on another show, "No Man's Land," at the same time. I wasn't sure how it all worked, if it was that both shows were on at once, perfectly timed so when a character left a scene in one show, he entered a scene in the other show (can you imagine the coordination that would require?) or if the shows went on right after each other (this would make more sense). I know now that the answer is that they alternate nights, but I didn't realize what was happening until the second act in "Waiting for Godot" when I realized that the first act was not the whole play. You only have until March 30th to catch these two amazing actors (who are also besties) on stage together. There are two other actors (Billy Crudup and Shuler Hensley) as well as a young boy for a minute or two, but all in all, it is a very simple show. The plot is that Gandalf and Picard are, indeed, just waiting for someone named Godot to arrive. It's funny -you may wonder if the slapstick and banter are ad-libbed because you could imagine McKellen and Stewart in real life talking the same way. It's also thought-provoking and there is a lot of analysis out there as to what playwright Samuel Beckett meant by everything - were the gentlemen waiting in pergatory? Waiting for God, instead of Godot? Are the other two actors meant to represent the main characters somehow? Is anything imagined? Go see it for yourself and we'll have a sit-down about it all, preferably over some carrots and not turnips. You'll get that joke once you see the play. I hope. When MK and I went to New Orleans last month, the only thing on the schedule aside from eating our faces off was a cemetery tour with Strange True Tours. Jeffrey, the owner of the tour company, was our guide for about an hour and a half of the St. Louis Cemetery No. 1, a Catholic above-ground cemetery near the St. Louis Cathedral, the oldest continuously operating Catholic parish in America. It's a common misconception that cemeteries were built above ground in New Orleans because of the flood lines, but the reality is that they are modeled after French and Spanish cemeteries. Most of the tombs in this cemetery are owned by families who are responsible for taking care of their tombs. Some families pay a fee to have the tombs taken care of by the church. After a body has been buried in a chamber for about a year, the heat causes the body's decomposition. Their ashes are then swept into a container and moved further into the tomb to make room for the next family member. You all know how obsessed I am with my current family members, but I'm also obsessed with my past family members and our ancestry. I thought it was so amazing to read the names and dates of people on the tombs and to see how many generations the families went back. I was particularly struck by this engraving. Jeffrey took us to different tombs and told us the stories of the families and people buried there. Homer Plessy of Plessy vs. Ferguson, the first mayors of New Orleans, and many musicians were laid to rest in this cemetery. I enjoyed the story of a man whose one wife is buried on the Catholic side and the other is buried on the Protestant side. Also good is the tale of a young man named Bernard de Marigny who inherited millions of dollars but died a poor man due to playing too many games of craps. Weirdo actor Nicolas Cage has actually purchased his own future resting place, a bizarre pyramid in the middle of the cemetery. There are a few graves thought to be the 'hidden' resting place of Marie Laveau, the famous Voodoo practitioner (one is pictured below). Visitors draw three X's and make offerings to Ms. Laveau at each of them. At one of them, visitors place their right hand on the wall of the tomb and make a wish. If your wish is granted, you must come back to New Orleans to thank Marie. Of course I did this, because I love making wishes. And I have no problem returning to NOLA one day if my wish is granted. Jeffrey brought us to a huge tomb with around 200 chambers that were all meant for people of Italian descent. This was common back in the day to pay dues to an Italian or Irish society to ensure that you received a proper burial when you passed away. This particular tomb played a part in the film Easy Rider. The filmmakers got in trouble for filming without a permit and for being disrespectful to the tomb by having the actors sit on the statue's lap. The movie unfortunately inspired fans to do the same to pose for pictures and now the statue's hand is missing. The cemeteries are open to people for free, but I definitely suggest taking a tour, specifically of course, one with Strange True Tours. It's one thing to walk in and read names of the people buried there, but it's an entirely different experience to actually learn their stories and the history of the cemetery. Jeffrey also offers a variety of other tours including "Women of New Orleans" and "Ghosts, Legends, and Lore." If you're daring, you can even smooch Nicolas Cage's tomb. It's actually a thing people do. Don't worry, I was not one of those people. Many thanks to Strange True Tours for the special rate. Opinions are always my own. I have been interested in Pompeii for about 20 years when I received a Kids Discovery magazine with the title. This issue was devoted to the ancient city buried during the eruption of Mt. Vesuvius in 79 AD. I read and reread the Pompeii and Pyramids issues as much as I read my Samantha Parkington books, never expecting to actually explore Pompeii myself one day. But that day did actually come, when my family and I traveled to Italy this past summer. The site is a quick day-trip from Rome and therefore is pretty crowded with tourists, but even with the crowds, this day in July was definitely one of my favorite travel days ever. When they started digging up Pompeii in the mid-1700s, archaeologists were delighted at what was found and preserved in the 30 feet of ash from Mt. Vesuvius. It was relatively easy to understand how the people in Pompeii lived, and from this town, we can assume that other Romans lived in similar ways. 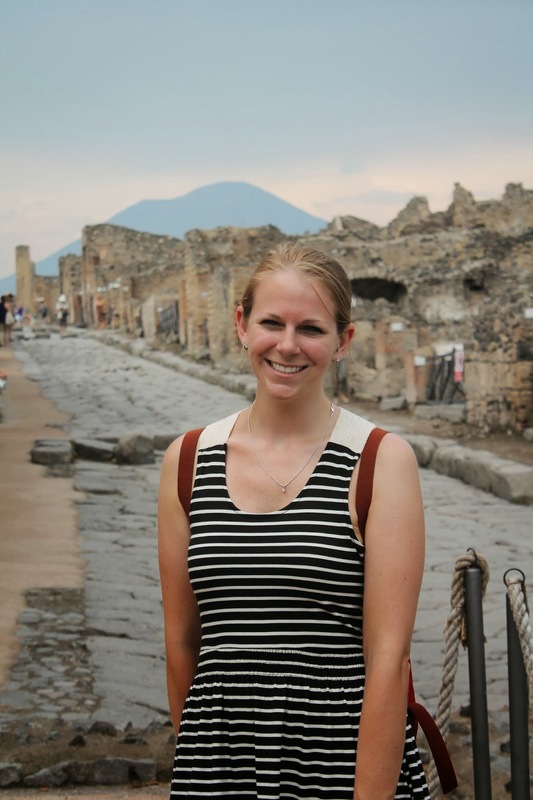 Pompeii was quite an advanced civilization for something from two-thousand years ago. This place had everything: a city hall, a farmer's market, a courthouse, bakeries, theaters, and public bathhouses with heated floors. 1994-Erin knew about the plumbing, shops, and fast-food restaurants (pictured below). 1994-Erin did *not* know about the brothel complete with a "menu" of scenes painted on the wall (not pictured below). 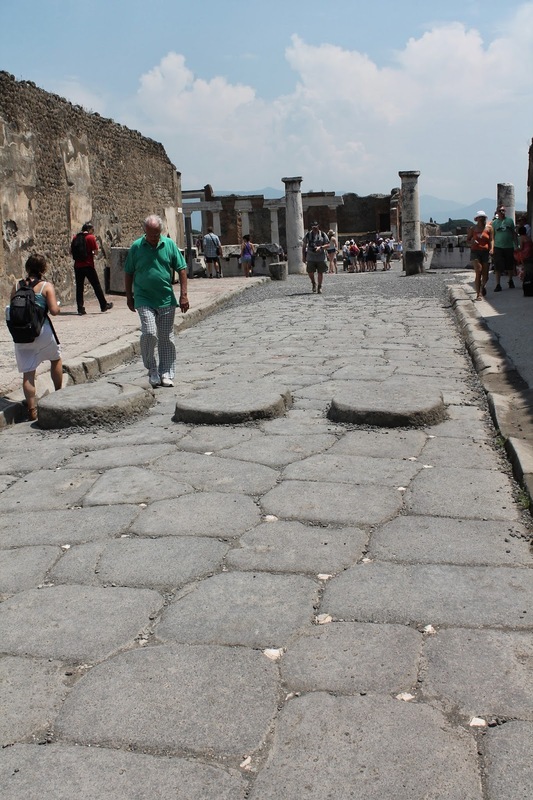 One of the things that impressed me the most were the streets of Pompeii. They were cleaned with water every day and so that people wouldn't ruin their cute Italian sandals, there were stepping stones in the middle of each street. The stones were spaced so that chariots' wheels could still ride the streets easily. Pedestrian walkways had different stones to block chariot traffic. Scattered between the stones were little pieces of white marble which reflect light in the dark and served as ancient street lights. While first wandering around Pompeii, it's easy to get caught up in the mystery of it and forget a little about the travesty that happened. But when you start to see the casts of bodies in their final positions, some with their arms up in an attempt to protect themselves from the ash, it's hard to forget. The majority of the relics dug up from Pompeii are actually in the Naples National Archaeological Museum which we did not make it to. Luckily, until April, many items are on exhibit at the Franklin Institute in Philadelphia. Katie, Jess, and I will be going there later this month to check it out. Just as Bastille's song mentions, "it almost (felt) like nothing changed at all," as in, because so many outlines of buildings, wall paintings, streets, and columns were intact, I could easily picture what it was like back in the day. Sure, the people would be wearing sandals and togas instead of shorts and baseball caps. There would be more horses and fewer photos being taken on iPhones. And similarly, I could also actually picture us living there in modern times, provided they install cable. PS - Thanks to my sister, Katie, for being my personal photographer throughout Italy. At first glance, I assumed the new sports bar, Bottomzup, in Kips Bay, was a new spot by the managers of Stumble Inn, Three Sheets, & Off the Wagon, which are the best bars in the city when you are under the age of 23 and the worst bars in the city when you are 23 or older. The "let's get drunk" name and the cartoon logo are a little misleading, because Bottomzup is unaffiliated with the aforementioned bars and I think it's a place that all would enjoy. Now, I'm not a big sports fan, unless we're talking Quidditch, but I do love myself a good neighborhood bar, and it appears that I've found a new go-to in Bottomzup. It's a fairly big space, filled to the brim with 45 televisions - to view any sport you want - and pictures of athletes who I have no hope of identifying except for the womens gymnastics team. A nice touch at this place is that there are charging stations scattered around - if you're anything like me, watching your phone battery run down can give you enough anxiety to ruin a fun night. Kristyn and I enjoyed a few drinks and appetizers there on Friday evening. I've yet to find a fried pickle I don't like - Bottomzup's "Atlanta Fried Pickles" are cut long and served with a "kickin' bayou sauce." Their "North Carolina Pulled Chicken Sliders" are oozing with both chicken and flavor. The next afternoon, MK and I went to Bottomzup for their new brunch deal. At $25, it's one of the least expensive all-you-can-drink brunch specials in the city. 90 minutes is definitely enough time to get your money's worth of mimosas, bellinis, screwdrivers, or Bloody Marys. Plus, remember, you get a meal in there as well - your choice of eggs & meat (including steak), a feta omelette, chicken & waffles, eggs benedict, and bagel & lox. I ordered the chicken & waffles because of course I did. The way Bottomzup does chicken & waffles is a lot easier for me to eat than other places I've tried. Instead of using fried chicken on the bone, they use their already delicious chicken tenders. This makes the meal way easier to cut, eat, and share. And hot dang, it was good. Besides the environment and the food, the other great thing about Bottomzup is that the managers and owners are genuinely interested in making sure everyone is having a great time. They passed out packs of Skittles and awesome mimosa-infused cupcakes with orange zest on top of the frosting. If you get as lucky as we did, just try to remember to take the wrapper off the cupcake before you dive in. This was hard for me to remember after a few bellinis. I'll definitely be heading back to Bottomzup many times over the next few months for the short walk from my apartment, the sweet brunch deal, and to watch some of the few sports I do enjoy - Curling and College Basketball (as long as I have my bracket and a highlighter). In future visits I will also take advantage of their Happy Hour deals - $1 Oysters, $2 Sliders, $3 California Rolls, and $10 beer pitchers from 4 to 7 every day. Many thanks to Bottomzup for hosting us for brunch. Opinions are always my own.